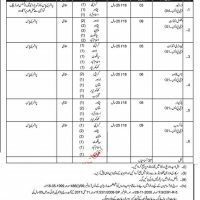 Applications are invited for appointment of Contingent Paid Staff in the Sahiwal Medical College / District Head Quarter Sahiwal. Every person living in Sahiwal and surrounding areas is recommended to submit their application along with supporting documents as mentioned in the advertisement before the last date. The last date for submission of application form has been fixed as 25th September 2018. 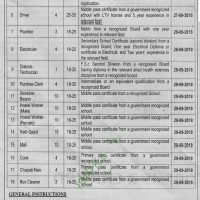 The advertisement has been published in the daily newspapers whereas 118 posts of various categories are shown vacant. Detail of the posts along with the qualification and eligibility criteria is given in this post. 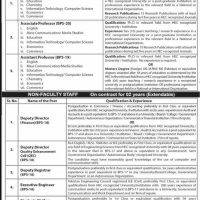 The administration of college has also mentioned the interview date in the advertisement. Sahiwal Medical College also known as SLMS was established in 2010. Ex-Chief Minister, Punjab initiated the program to provide medical education in every province, therefore Sahiwal Medical College was established. It is associated with District Head Quarter, Sahiwal. The medical student living in this area are able to get the quality medical education in their own city. Hundreds of student are getting the education from this institution. Application on Plain Papers with CV, Two Pictures, Educational Documents, Domicile (Punjab) and CNIC must be attached. The application must be reached in the Admin block of SL<S before 25-09-2018 before office closing hour. The schedule of wages rate issued by the Finance Department Govt. of Punjab will be followed for the unskilled, semiskilled and skilled worker. The interview will be conducted as per schedule. No separate call/letter for interview will be issued. Latest Government rules & regulation/policies will be followed regarding age limitation, age relaxation. General age relaxation in upper age limit for male candidates is 5 years & female candidates are 8 years. Eligible candidates appearing for interview must bring the original documents. Employees already serving should apply through proper channel form their respective department along with NOC. Recruitment will be made as per Government recruitment rules/policy. The Competent authorities are authorized for any change of schedule and number of posts etc.